Susannah Nairn was born in the area of Shoreditch known as Webb Square, 18 March 1762. Shoreditch, was a district on the outer edges of the east end of London. She was the daughter of Thomas Nairn and Susanna Smith. When Susannah was born Shoreditch was home to many theatres and also to a thriving textile industry along with a burgeoning ‘piece work’ industry. 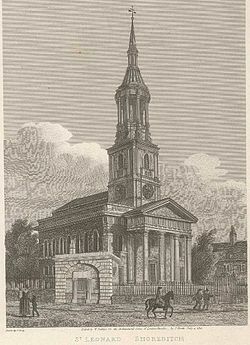 Susannah was baptised on the 11th April 1762 at the ancient parish of St Leonards Shoreditch. Surprisingly good and informative records exist of this in the parish register. An interesting bit of trivia is that this was the same church that features in the children’s rhyme; The bells of London town. The rhyme was first published in 1744, however the rhyme is believed to go as far back as Henry the eighth. When Susannah was growing up, Shoreditch was the fastest growing area of London. Tradesmen, merchants and labourers lived in the overcrowded area. Housing was frequently tenement style. Land that had been homes was reclaimed for factories and warehouses. Extreme poverty for many was a way of life. Overcrowding in the city was endemic. Older trades such as ale houses and and prostitution rubbed alongside their neighbour crime and petty thievery. The city was considered a much poorer area being as it was beyond the walls of London town. On the 28th June 1784, Susannah who is recorded as the widow Tolbert of the same parish (St George in the East, London) married Thomas Reiley (misspelt?) by Banns. On the register Edward spells his name as Reilly. (yet another variant or that Edward was illiterate?) When Susannah would later remarry (for the third time in Australia she would continue to use the ‘x’ to mark her name. We can safely assume she could not read or write. Of her deceased husband Tolbert/Talbot, I know nothing. Susannah and Edward had a son together Thomas Riley born around 1788. In 1791 Susannah a married woman with a child of around 3 years was caught and subsequently accused and convicted of stealing ten muslin handkerchiefs. Susannah’s trial was on the 26th October 1791. The records describe Susannah as being about 29 years of age, four feet ten inches, with brown hair, grey eyes and a fresh complexion. It states her name as Susannah Nairn alias Naen, alias Talbot and also known as Susannah, wife of Edward Riley. October 1791, trial of SUSANNAH NAIRN, alias NOON, alias TALBOT, alias RILEY (t17911026-11). SUSANNAH NAIRN, Theft shoplifting, 26th October 1791. SUSANNAH NAIRN, alias NOON, alias TALBOT, alias RILEY , was indicted for feloniously stealing, on the 14th of October , ten muslin handkerchiefs, value 20 s. the goods of Anthony Twiddle , privily in the shop of the said Anthony . I am a brother to the prosecutor, he lives in the Minories ; I was in the shop when the prisoner came in, on Friday, 14th of October, about six o’clock, I saw her come in, and she asked for muslin handkerchiefs; I shewed her some; she looked them over about ten minutes, she agreed to have one cut off for four shillings and six pence, she did not pay for it, she said she would go over the way and fetch her husband, he wanted something for shirts, she went away, and never returned; I did not miss any thing then, the next morning a gentleman came to our shop; he had the prisoner secured, we looked over the goods and missed a piece; I never had seen the woman before: I swear positively she is the same; we lost ten handkerchiefs, all in one piece; I shewed her the same piece; I shewed her several pieces, this was the first I shewed, there is a shop mark upon it, different pieces have different marks; I put this piece under the rest; I packed up the things; I have never seen the piece since it was stole, there was only Sheldon and two customers in the shop, besides me and the prisoner, four in the whole. I am shopman to Mr. Twiddle: I saw the prisoner come into the shop, the first witness attended her; she had no cloak on; I am sure it is the same person; on the morning following, a gentleman brought the mark and shewed to me; I went to the place where the muslin was stopped, and saw the prisoner and the muslin, it was marked in characters made by my master, it is the characters used by the shop, we sell goods with the mark of the shop sometimes; I think I had seen it the day before, the wrapper had not been opened that day until she came in; I can with propriety swear it was my master’s property, the value is twenty shillings; I do not know either of the other customers; this woman was in view of the other customers in the shop. I keep a shop in Red-lion-street; the prisoner at the bar came to my shop, and brought a piece of muslin handkerchief in her apron; she wanted some person to help fold them up; she asked a lady who was in the shop; she came to me in a room adjoining the shop, she came in and gave me the folded part, there was two loose; I told her I thought they were not hers; she said they are not. I told her to send the owner for them. She returned in a quarter of an hour, and said now I have brought the owner, I am the owner said she; she said, I stole them, and what do you think of that? she had no name she said, she was born in the reign of King Charles. She repeatedly told me she had stolen them, I asked her of whom? she refused to tell me. I delivered the property to Christian, the officer, that night. She came to me the 14th of October, between six and seven at night, the man’s name is Gilson who took the shop mark to Twidle’s; when she first came she appeared sober, but when she came the second time she appeared in liquor. I am a constable, I produce a piece of muslin handkerchief, I received it from Mary Edmunds ; the prisoner told me she had bought them at 2 s. each in Rag-fair; after all, she said she had stole them. I do not know that she was drunk, she appeared in an odd way. Levi Twidle . I can swear that they are our handkerchiefs, my Lord. Solomon Sheldon deposed to the handkerchiefs. About half an hour after three the woman who had these handkerchiefs, asked me 2 s. 3 d. a piece, I bid her 2 s. she followed me to the Rosemary Branch; I bought them, I was obliged to make a pledge to buy them. When I was in the shop the gentleman shewed me only two pieces of handkerchiefs, and two pieces he took back again. GUILTY, of stealing, but not privately in the shop . Now was Susannah a thief? or was she just not too bright in getting caught up in selling stolen goods like this? Either way it’s all academic as she was convicted of stealing the ten muslin handkerchiefs and was sent to Newgate Prison where she was held before being transferred to the Kitty upon which she sailed to the penal colony of Port Jackson (Australia). 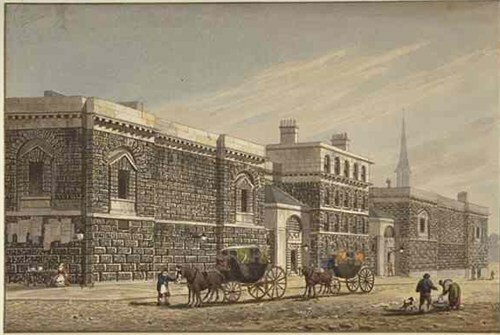 The London Sessions of Gaol Delivery record Susannah as being convicted and to be transported beyond the seas for seven years. To the best of my knowledge I have not been able to locate any records that would indicate that Susannah’s son Thomas Riley accompanied her and can only assume he stayed in England with his father or another family member (? ), never to see his mother again. Susannah was delivered to the ship the Kitty on January 31st 1792. The Kitty left Spithead in London on the 31st March of the same year. Not long after she puts to sea, the relatively newly built Kitty was found to have a leak and was forced to return to Spithead for repairs. Aboard were ten male convicts and 30 female convicts. Whilst the ship was in Spithead for repairs, eight of the male convicts escaped. The ship left again from Portsmouth on the 6th April 1792. She was plagued however by ongoing leaks and pulled in at Rio De Janeiro and again at the Cape of Good Hope on her journey before again setting off on the 7th September 1792. After an arduous and difficult journey the Kitty finally arrived in Port Jackson on the 18th November 1792. Upon arrival a great deal of her cargo was found to be damaged. This included flour and iron pots. The young colony of Sydney rather than welcoming bounty from England instead received yet more mouths to feed. The Captain of the Kitty was Captain Ramsay. Whilst on board remarks are recorded that Susannah was delivered of a son during the journey. Given that Susannah had been away from her husband for over twelve months, Edward Riley could not have been the father of young John Riley. So technically speaking our journey for the Riley paternal tree stops with John. Susannah’s convict indent arrival records show her giving her names as Nairn, (various spelling’s thereof, Riley and Tolbert. Susannah and her newborn son would have been taken from the ship to land and then amongst the busy throng that was the harbour they would have been loaded onto boats with other convicts and then ferried up the Parramatta river to the Parramatta settlement which was also the site of the Parramatta Gaol. From there your future was decided. You were ‘assigned’ to work for a family/farmer/business. You stayed in the Gaol. A few years later a female factor would be established. Accept a marriage proposal – the fact that you or your spouse probably had other families back home was conveniently overlooked. 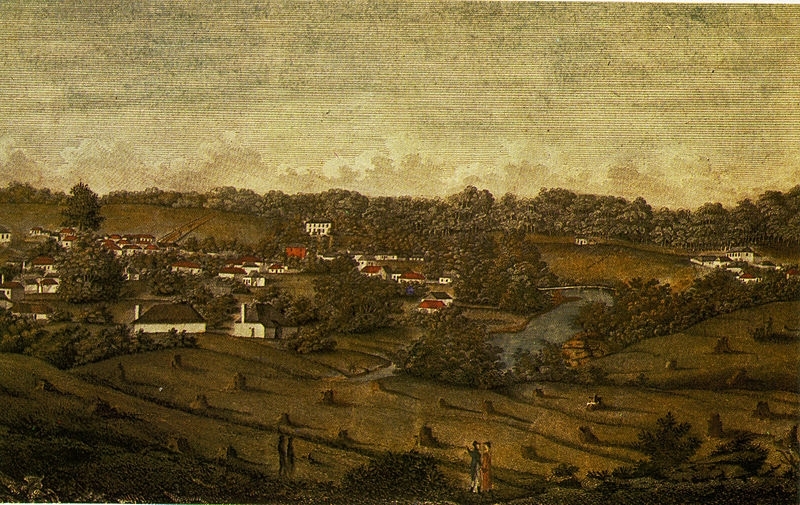 When Susannah arrived in Parramatta it was a small settlement that had only been established by Governor Phillip’s orders five years before in 1788. It is today the oldest inland European settlement in Australia. Parramatta is now a central suburb as part of Greater Western Sydney. When Susannah arrived it was the first area the settlers had found which showed the soil to be good enough to support farming and agriculture and a fresh water supply on the banks of the Parramatta river. The Aboriginal people of the Darug tribe had lived in the area and called it Burramattagal. It had been an area for them rich in food and water supply with a temperate climate. An unusually large and ready supply of eels provided the local protein in abundance. 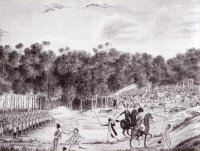 Governor Phillip first named the area Rose Hill but latter changed it to Parramatta to reflect the Aboriginal name. Parramatta became the first place in Australia where grain was successfully grown in viable quantities to feed the colonials and very soon thereafter Elizabeth farm the home of John and Elizabeth Macarthur was established where the first commercially raised sheep were raised. It was from this initial success that the tide turned so to speak and Australia was able to establish growing her own food for the new inhabitants rather than relying on stores brought by ship from England. Had this not occurred the white settlements would surely have foundered and the colonisation would have been a failure. On the 20th January 1793, a mere handful o months after arriving, at St Johns in Parramatta Susannah married Robert Wells another convict of the Parramatta district who arrived with the third fleet. Given that she was barely off the boat with a newborn I think we can safely assume that this was likely no love match and more a marriage of convenience that was probably foisted on Susannah by the authorities of the day and one that she figured would get her and John out of the Gaol. Those same authorities who had asked the government back in England to send wives for the convict men to ‘settle them’. What convict women had in common was always their poverty; and their lack of independent opportunity. John stayed with his mother and new step-father. Susannah and Robert went on to have a daughter together, Esther Wells. They probably lived in something of a slab hut with no running water and very sparse conditions. Furniture would have been what they had cobbled together and the home undoubtedly was a dirt floor. Their clothing would have been the rations from the government store. Life would have been quite hard for the Wells family in this new settlement. Food would have been basic and meat would have been kangaroo and whatever else Robert would have been able to trap. The great Australian food damper would have made up a goodly portion of their daily calories. 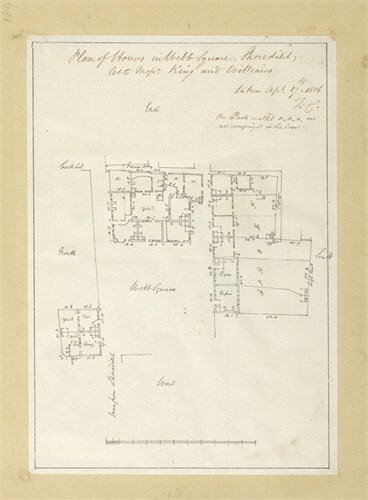 Susannah and her husband Robert were living on what appears to be a farming property at a place called the ‘north boundary’ in the Parramatta district. On the 19th June 1803 there is an editorial in the Sydney Gazette & NSW Advertiser that reports from the Judge’s Advocate’s Office of a John Weftwood (Westwood) and Michael Ryan who are examined and convicted on a charge of stealing corn, the property of Robert Wells. (What is it with my family and corn!) – (See the story for Susannah’s grandson William London). Robert Wells knew how to improve his lot and often was a private soldier for the Government of the day and was also involved as a member of the Active Defence Militia in the uprising of 1804 which became known as the Battle of Vinegar Hill. In the records of the uprising he is recorded as a Parramatta Loyalist. Was this because he was a staunch Royalist? Or more likely that he knew he would be able to bargain for a better quality of life if he volunteered his services. Unlike most of the other Parramatta Loyalists, Robert Wells took an active role in the search and arrest of Samuel Humes party at Castle Hill. The battle of Vinegar Hill and it’s subsequent follow up at Castle Hill erupted when Irish Catholic convicts bristling at the constraints and their second class treatment by their English captors rose up in rebellion. Though poorly equipped they went up against twenty nine New South Wales Corps and fifty volunteers of the active service militia. The exact location of the battle is still hotly contested in local history circles. However what is now Toongabbie is generally agreed to be one of the locations involved in the incident. Vinegar Hill Irish convict uprising. The rebels had requested rather poetically and somewhat dramatically, “death or liberty” and on a rather more practical note, ‘and a ship to take them home.’ However this was not to be and they were rousted in a rather bloody skirmish and there followed a grim period of punishment including hangings, brutal floggings and for many being shipped off to the diggings for hard labour at the new and distant colony of Coal River. Now also known as Newcastle. The Irish in the early days of Australiana colonial history were the lowest on the social class rungs and the problems that existed in Britain between the Irish and the English only came out to be repeated in the new colonies. Organised rebellion was the goal of many Irish. Right up into the 2oth century “INNA” (Irish need not apply), was a reasonable description in excluding this group from employment and other opportunities. In the convict muster of 1806 Susannah is still recorded as “Riley” and was in the employ of Robert Wells with them living at Parramatta. Employ is probably a fairly loose term, given that we know in early colonial history, the convict women were encouraged to marry the convict men to populate the new nation and with the hope that the respectability of marriage and family would slow down the opportunity for their ‘wild ways’ to continue. It is likely that she was ‘assigned’ to Robert Wells given her convict state. Susannah Nairn died aged at what would have been considered quite elderly at 52 on the 25th March 1814 at Parramatta and is buried in St John’s Cemetery. One of the oldest graveyards. Standing stones long worn pinpoint the graves of her earliest residents. No distinction is made between creed or social standing in this section and one was buried purely in the order that they died and the next available plot. Amongst these spaces lays Susannah Nairn. Susannah had been twenty-three years in the new colony. I don’t know what sort of marriage Susannah had with Robert. The fact that she was barely cold in the ground and he remarried makes me think that he couldn’t have been grieving her loss particularly even though they were married the better part of twenty years or maybe it just made good sense to remarry quickly and have another set of hands to help out? Robert Wells married, Sarah Longhurst in Parramatta less than three months later. From what I have gleaned their’s was not a happy marriage and the stability of their children not guaranteed as Sarah frequently left the marriage and would then return; in the finish Robert took up with another woman Sarah Lawson. With Sarah Longhurst he had Thomas Wells and Robert Wells. Sarah also had children of her own from previous relationships. Robert went on with Sarah Lawson to have two more children Joseph and Sarah. Robert and Susannah’s daughter, Esther went on to have a very tumultuous life herself. Two marriages and children that she had relinquished to have raised by other family members in between raising them and leaving them and travelling rather far distances before being buried in Queanbeyan, as I understand by strangers. Robert Wells died 22 Sep 1885 and is buried at St. John’s Parramatta. Did Robert and Susannah have other children together? Did Thomas come out from England with his mother on the Kitty or did he indeed stay there? Did John ever find out who his natural father was? By comparison Susannah’s son, John Riley went on to have a rather stable life with his one wife Catherine Latimore/Lattimore. Thank you for your kind comments Anne. It’s always a great thrill to find other branches of our great family tree. As always I’m happy to share anything I find and hope to ‘get it right’ as much as I can as often as we can. 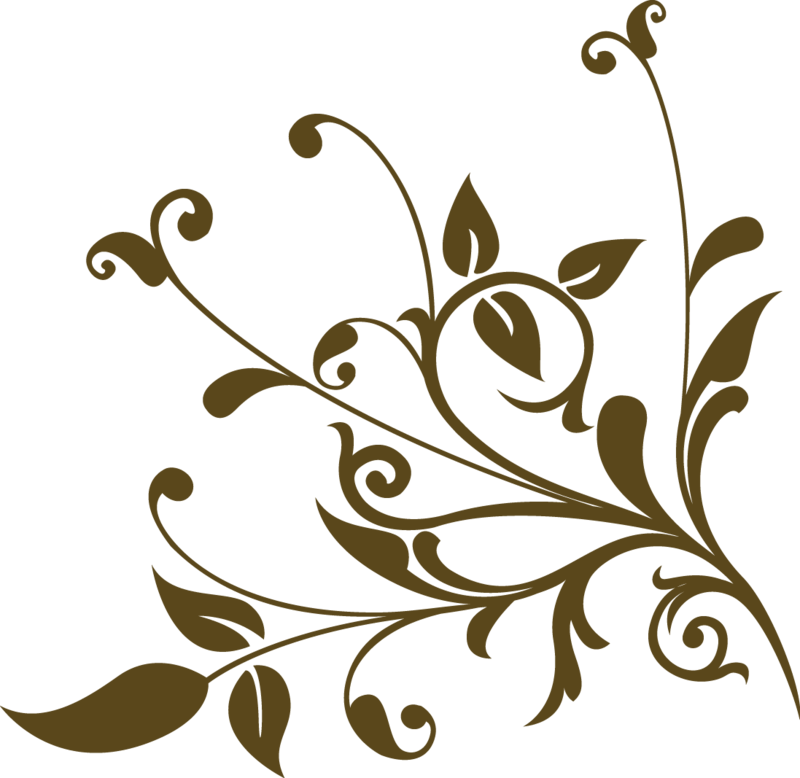 I’m also a descendant of Esther’s – through her daughter Emma Griffin (nee Brown). I found the ‘letter’ very interesting & hope you do too, if you haven’t already seen it? I am a descendant of Susannah Nairn and always updating my history so delighted to find a few extra snippets for my files. Always wondered about Esther Wells and family although no relation to my side. Susannah married Edward Riley in UK, then had her son John Riley probably on ship “Kitty”. Always noted he came “free”. Suspected real father may have been someone from Newgate as she had no contact with husband Edward in the time evidently. He was always known as John Riley. John married Catherine Lattimore and their daughter Martha married Thomas Wright, their son another Thomas married Ann Sargeson, and their son John was my grandfather.Thank you for your story. John Riley (Jnr) born about 1822, met Catherine Beckett (nee Reynolds) about 1842 & died 1907 in Warialda (my great-great-grandparent). Diana Riley born 16 October 1824 in Parramatta-NSW, married William London on 7 November 1841 and died 26 July 1905 in Richmond, NSW. William (aka William the Native) was born 1809 in Ireland and died 30 December 1877 as a result of a typhoid outbreak at their son Robert’s home at Sally’s Bottom/Sallias Flat. Susannah Riley born about 1826 in Prospect-NSW, married Edward Wilson on 1 April 1847 and died 23 June 1905 in Kurrajong, NSW. Elizabeth Riley born 6 April 1929 in Prospect-NSW, married Timothy Wilson on 30 March 1848 and died 3 November 1882 in Kurrajong, NSW (Edward and Timothy Wilson were brothers, their father Job Wilson was a convict and their mother Elizabeth Ann Rodgers, was the daughter of convicts; John Rodgers and Elizabeth Celey). Edward Riley born 12 November 1832 in Prospect, NSW, married Mary Ann Delaney on 25 February 1854 and died on 21 May 1914 in Kurrajong. 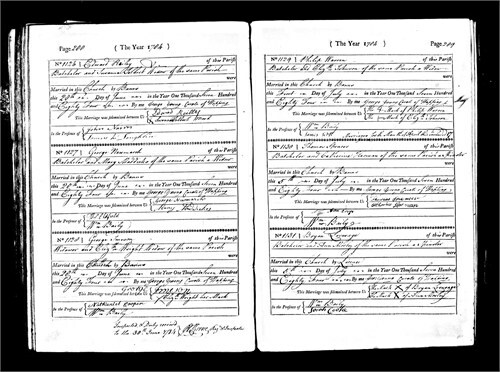 Martha Riley born 2 February in Colo, NSW, married three times (1) Thomas Wright on 17 May 1852 (2) John Turner on 16 January 1862 (3) Thomas Matthews on 10 September 1881 and died 20 June 1917 in Gulgong, NSW. Thanks Anne so kind of you to reply. Suzannah sounded a character didn’t she? Very strong willed I would imagine. I will look up Facebook as you suggested. Would love to attend but not sure of timing. Thanks for the information. Regards, Helen Stevenson. Hi Anne, I am currently researching my maternal line and am also a descendant of Susanna Smith>Susannah Nairn>Esther Wells>Sarah Brown>Elizabeth Clarke>Alice Jane Ellison>Roma Gloria Howell (my mother). I am keen to connect with others who have already spent time researching and learn more these women and their lives. Is this group still going?